Greetings, one and all!I thought I’d present for you today the first instalment of an ongoing project I like to call ‘Pomading the Pre-Mades.’ I’ve really enjoyed the versatility and creativity of other talented Sims 2 creators, when given the pre-made characters in the Sims 2 ‘hoods to play with. Wonderful examples of this includes Skelljay’s awesome ‘Fortune and Romance’ Pleasantview story, and Winter’s gorgeous Renaissance retelling of the Veronaville crew in ‘Winter In Verona’. But there seems to be a gap where the 18th century is concerned – which seems a real shame, as the neighbourhoods in Sims 2 are practically made to be isolated colonial provinces! 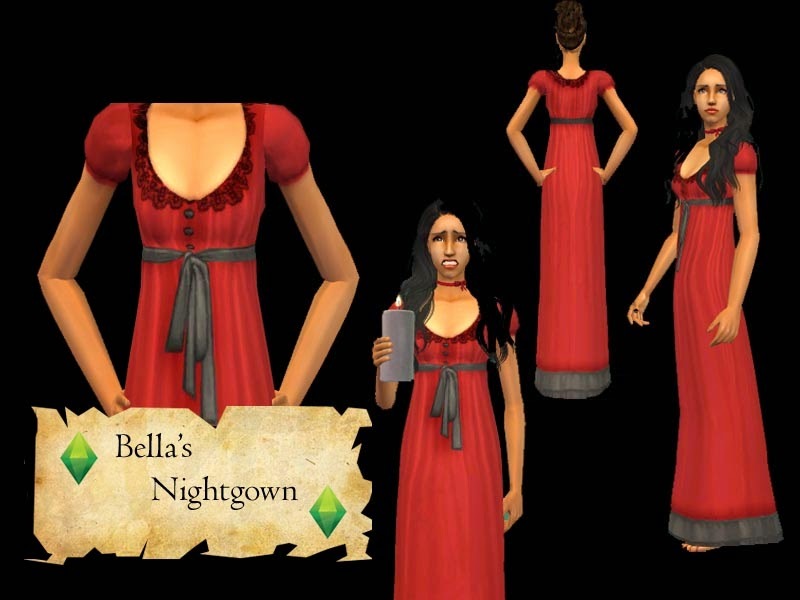 As the foremost lady in the Pleasantview province, Bella will need to look rather special – she is married to a Goth, after all, and the Goths are the richest Sims in Pleasantview. Bella’s outfit will also need to be red. 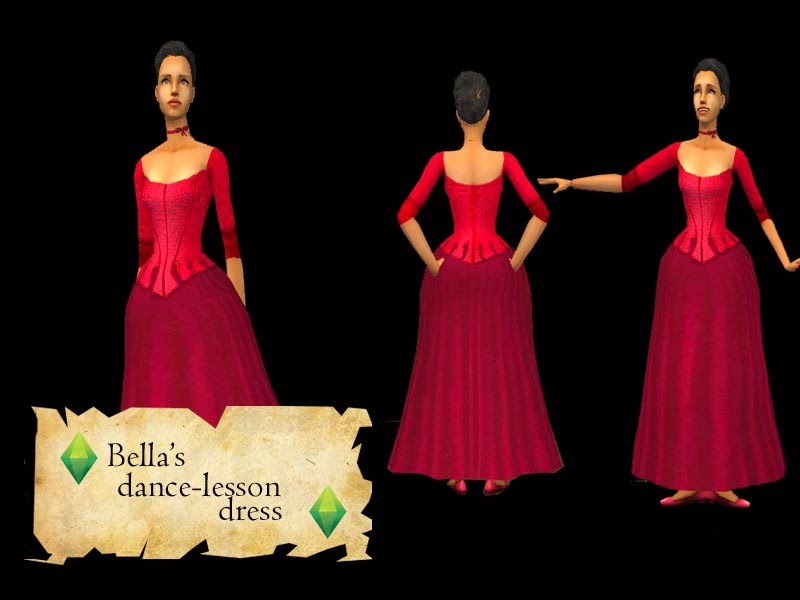 That’s a fundamental fashion statement about Bella everyone remembers from the games, and you can bet 18th century Bella isn’t going to be any different! Historically, lasting dyes were hard to achieve until the introduction of aniline dyes in the 19th century - so rich colours were a sign of wealth. Bella’s showing just what position she holds in Pleasantview, and that’s certainly at the top of the tree. 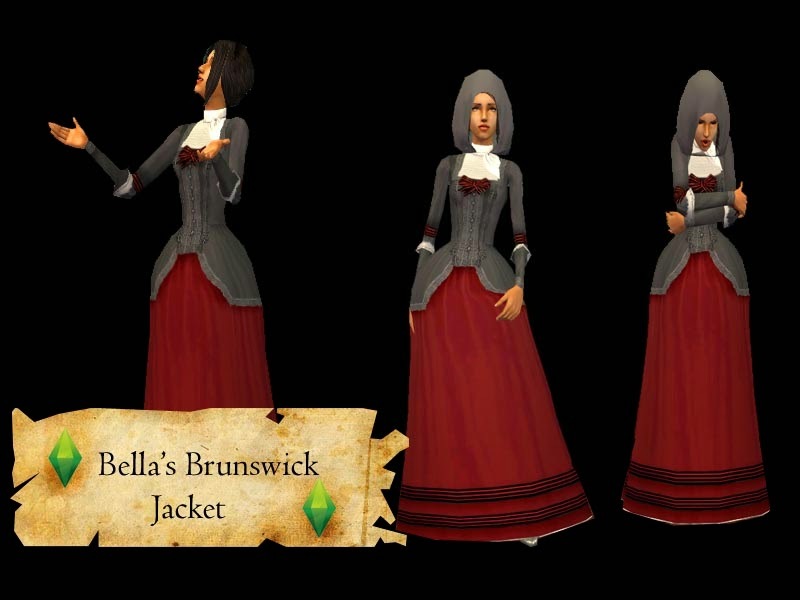 So, without further ado, I present the capsule 18th century wardrobe of Mistress Bella Goth of Pleasantview: One everyday gown, two formal gowns, a shift for underwear, a nightgown and a Brunswick jacket ensemble, complete with matching hood. This is based on a 1770s style of gown known as a compere front. 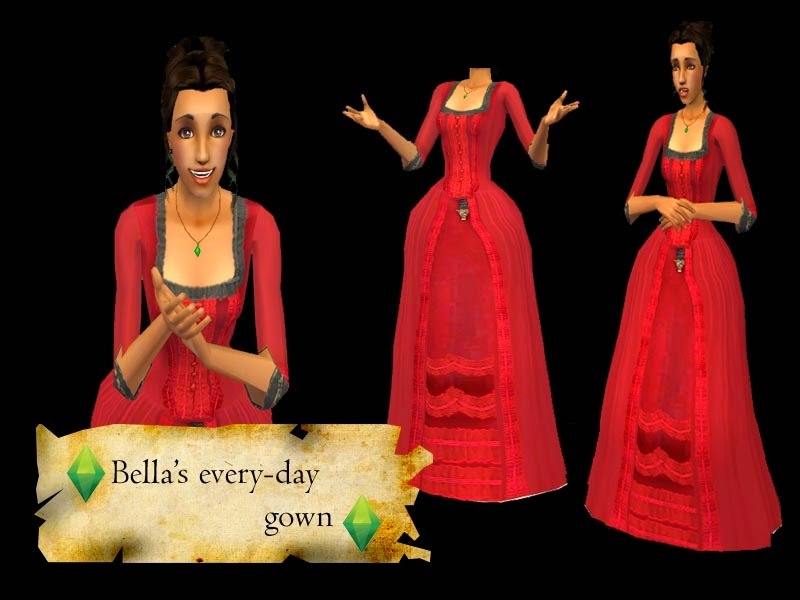 Note the buttons on the front of Bella's gown? These were often just decorative embellishments on the 'false front'. The bodice would actually hook or lace up at the side. Bella is working what I would call the 'Practical, but dressed to kill' look. The gown ticks all the right boxes for a woman in Bella's position. She's wearing a glorious tomato-coloured silk, and she has a little spy-glass on black ribbon at her girdle (possibly for staring superciliously at other members of the gentry?) Her hoops aren't excessive, as this is an everyday gown. 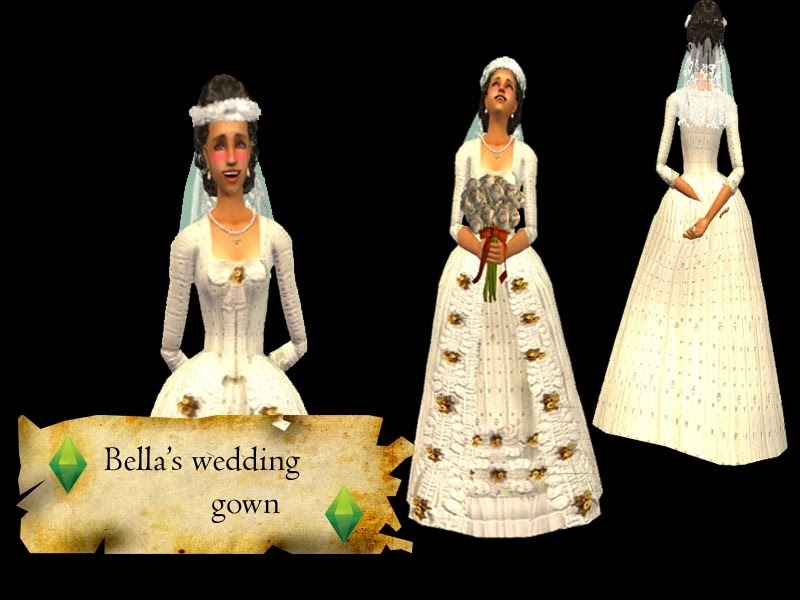 I splurged a bit here, and came up with Bella's wedding gown as well as a formal gown (for those casual entertainments and card-parties, as opposed to grand balls). Bella's wedding dress is a court gown and that means ridiculous hoops! This was the height of fashion in royal circles and the highest echelons of society. The gold and silver embroidery emphasized the status and wealth of the wearer, and made a lovely glittering effect in dim candlelight, especially with the gilded ribbons and frothy engageante sleeves. Somewhere along the line I decided Bella wasn't really one for corsets if she could get away with it - so when she's in her undies, it's simply a shift and stockings, held up by scandalous red garters. Massive, massive love to heget over at PBK for her generous recolour & texture policy, as my own attempt at stockings didn't turn out very well! I went unashamedly " Mills & Boon/ Gothic novel" on this nightgown -if you squint, it's sort of period-accurate? But it's very appropriate for wandering around the darkened halls of the Goth mansion, candlestick in hand, so I just rolled with this one and let the period accuracy slide. Red with black lace trim and a ribbon at the waist. My first attempt at an everyday gown for Bella, but after some research I decided this would be much better as a dancing gown, or 'ballet' dress. 18th century ballet costume tended to be ankle length rather than the tutus that have evolved today, so I kept this simple brocade bodice and plain skirt as a nice, period-appropriate bit of attire of Bella to use the ballet barre in. This is probably one of my favourite pieces for this wardrobe set! It’s based on a very popular hooded short jacket from the 18th century, known as a Brunswick. This was generally worn as outerwear or travelling dress, like a riding habit. The hood protected your elaborate hairstyles from wind and weather. Bella’s is dove grey with a few of her signature colours in her trimming and skirt. Comes with a recolour of GeneralZoi’s hood from the wonderful ‘hooded cape’ set. I can't believe no one has commented on how beautiful this set is, but it really is lovely! It doesn't fit either of my historical hoods - Medieval and Victorian respectively but it's tempting me... Such a perfect 18th century interpretation of Bella.